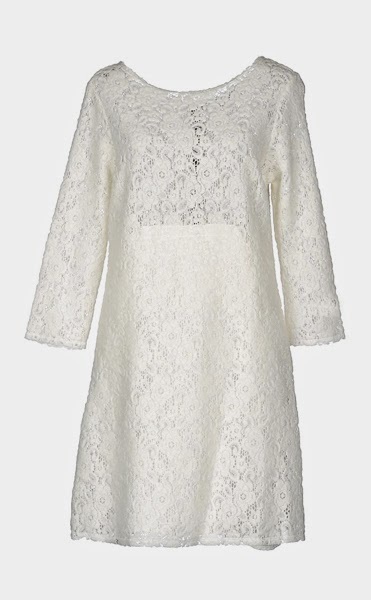 Should I wear white to my second wedding? 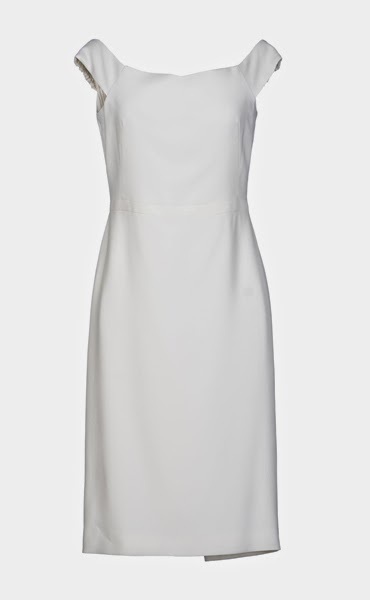 Like many second-time brides, I’m wondering should I wear white to my second wedding? According to modern etiquette, anything goes. But that doesn’t mean its an easy choice. As a second time bride I can choose to wear pretty much anything! Doesn’t that just open up a whole world of wonderful possibilities? I actually quite like the idea of non-traditional white or ivory dresses for encore brides. But I personally think veils and long white wedding gowns look ridiculous on divorcées and older brides… in a mutton dressed as lamb sort of way. It’s not good. From the second Robert slipped Jackie onto my finger, I knew I wouldn’t be going the traditional bridal route. I’ve done the white dress and veil and now I want to wear something that reflects my style and who I am as a woman, wife, and bride. For about 10 seconds, I entertained the thought of a vintage tiara and a knee-length 50’s inspired a-line dress in ivory, but it was too bridal and seemed reserved for a demure type of bride that just doesn’t exist post-divorce and close to forty. 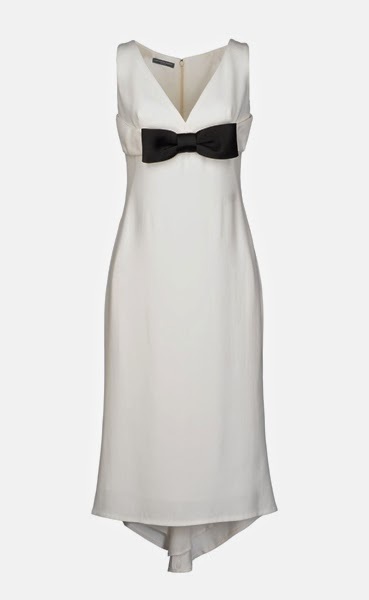 Or I could go with an elegant, slightly slinky bombshell-inspired dress in white or ivory. While I like the idea of a non-traditional white or ivory dress, I’m not sure I see myself wearing one. My grandmother chose my first wedding dress… a cheap, scratchy meringue from David’s Bridal. It smelled like fish, and the veil was decorated with rhinestones and faux pearls that photographed like bugs caught in a mosquito net! I looked ridiculous. I looked like me dressed up in a bride costume. It’s been 14 years and still hate that dress! Wedding gowns are a racket anyway. The price-tag on that horrible David’s Bridal meringue wasn’t exactly cheap but it was definitely built not to last. The stitching was sloppy and coming apart, the beading was substandard, and the fabric was embarrassingly third-rate. For the same amount of money, I could’ve had my pick of designer dresses that looked amazing, felt amazing, and could’ve been worn time and time again. This time, screw the wedding industry! I want a stunning designer dress that I’ll wear again and again because I love it so much that I cannot bear not to wear it again. This one is from Alexander McQueen and it’s the most wedding-y of the bunch. I can’t see myself re-wearing it, but it’s an Alexander McQueen and I can totally see myself wearing it in Gibraltar with my Christian Louboutins and a hand-tied bouquet of red roses to match those beautiful red soles! Be still my beating heart! It’s a Gucci… need I say more? Will I wear white to my second wedding? No, I most likely won’t be wearing white to my second wedding. It just doesn’t represent who I am, how I see myself, and how I want to present myself on my wedding day. There are so many other colors and styles that appeal to me much more than a white bridal dress. When else will I have carte blanche to go out and buy any designer dress I want, guilt free? 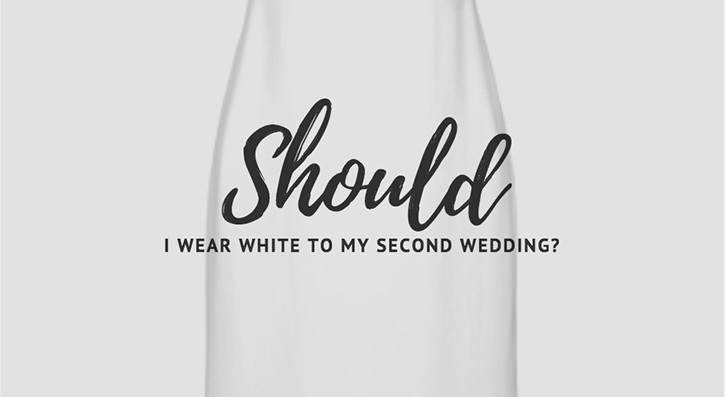 But if you’re a second time bride who’s asking yourself, should I wear white to my second wedding? And if you have your heart set on wearing white, why not go for it? It’s your day, your dress, your memories, and your photos. Do as you please and make no apologies. Are you remarried or planning a second wedding? What did you wear? How did you answer the burning question, should I wear white to my second wedding? I really like the Gucci… Can I have a vote? You would be alarmed, but you weren’t there, so am telling myself, what would that matter?! My wedding dress cost a mere $15, wasn’t white, but lace & fun — good for the day & a stroll barefoot on the beach after the Justice of the Peace… My friends/witnesses surprised me flowers, lipstick & cake to match upon their arrival (because they feared as a plain Jane I wouldn’t be prepared with such — they were somewhat right, but then we treated them to a wedding dinner cruise after signing papers, so? We all loved the time on the boat so felt it better to spend our $ on that…). Honestly, I would have worn the dress again, but somebody stole it! OK, wee hours for me here… Chatty fingers up to no good. All great choicesbut I especially love the Alexander McQueen. I can see you rewearing it. Gucci forever… it’s so chic! Given the other dresses you’ve posted over the years, I say the Gucci is completely you. 2nd vote for the Alexander McQueen dress! Chic and elegant without being stuffy. Love that contrasting black bow. what an exciting dilemma! I absolutely adore the Gucci, even before I saw the name. But the 60’s lace is so cute and so is the 60’s shift…Oh I’m glad that I don’t have to choose. I’m sure that whatever you decide you will make a beautiful blushing bride. ps I love that you call your ring ‘Eddie’ after grey doors. Hmm… Back again (Sorry, I am spending too much time online without knowing where else to go!). Minus sleeves and died a deep maroon, that was my wedding dress. Know I was suppose to wear white, but what the hey! Live life your own way. I have no regrets, but quite possibly because I had no photographer and someone stole that dress so I couldn’t wear it again (& again)! I still vote for the Gucci one if you can afford it. What I truly appreciated most with that $15 dress was that I had a fabulous getaway that I could treat my friends to and no debt to come back home to. In this situation, second time around, I think you should do what your heart dictates in this case & you’ll wind up with no regrets. Plus… I won’t be there to steal your dress! OK… Perhaps needed now a little time offline for me & give you some space to decide what you are doing! Best wishes to you and Robert! It’s such a treat to read all that you’ve been sharing. Now you’ve got me thinking enough to weigh in on the dress. The Gucci. That said, if you’re still exploring I think that Ralph Rucci holds possibilities for you. 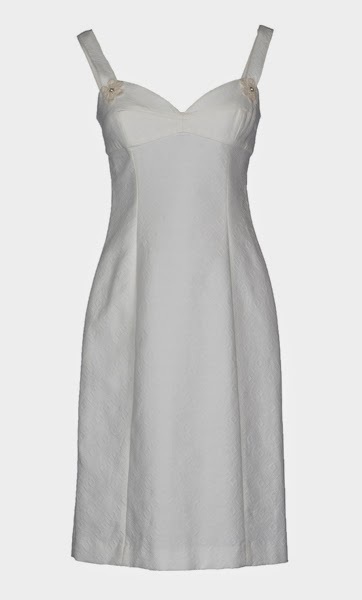 I keep wondering if you wear white dresses in “real” life though, for casual summer or special events? If not, your passion for another color (red family? ), or white/ivory with another color as a graphic or design element, might bring as much or more joy and more opportunities to wear after your Gibraltar wedding. As you can tell, I’m not a traditional girl! Look forward to the final choice! The color (or lack of) is really a sticking point for me. 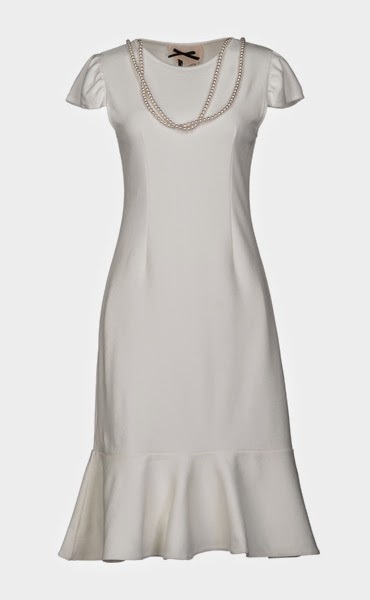 It would be a shame to have a beautiful Gucci dress hanging in the closet not being worn, but I can’t see myself ever choosing to wear it over one of my other dresses, unless I was attending a white-themed event. P.S. 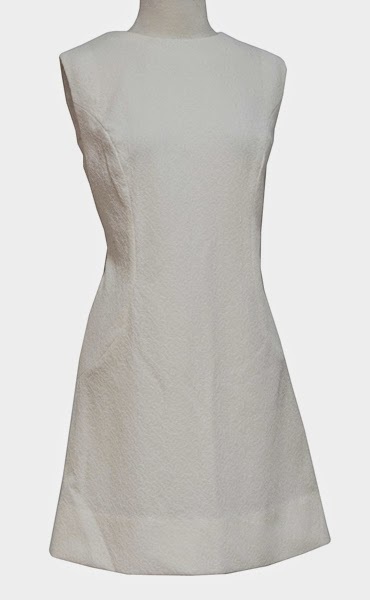 Ralph Rucci REALLY knows how to design a dress! Sage, I couldn’t agree more – on all counts! While white dresses are a go-to for some women, I didn’t think that was “you,” so I hope you’ve moved past that point. Have fun, feel beautiful. Can’t wait to see what ultimately feels right to you! Thanks, all for your lovely comments!